Naveen Kumar Gowda (born 8 January 1986), known by his stage name as Yash, is an Indian actor best known for his work in Kannada cinema. He began as an actor appearing on stage and in television shows in Kannada language. Yash made his feature film debut in 2007 with Jambada Hudugi, playing a supporting role. In his second film, Moggina Manasu (2008), he played the male lead opposite wife Radhika Pandit. The film was a success and earned him the Filmfare Award for Best Supporting Actor. He went on to star in many commercially successful films including Modalasala (2010), Kirataka (2011), Drama (2012), Googly (2013), Raja Huli (2013), Gajakesari (2014), Mr. and Mrs. Ramachari (2014) Masterpiece (2015) and K.G.F: Chapter 1 (2018). His rise to success has been well documented by the media, and has been often rated one of the popular actors in Karnataka. Naveen Kumar Gowda (born 8 January 1986), known by his stage name as Yash, is an Indian actor best known for his work in Kannada cinema. He began as an actor appearing on stage and in television shows in Kannada language. Yash made his feature film debut in 2007 with Jambada Hudugi, playing a supporting role. In his second film, Moggina Manasu (2008), he played the male lead opposite wife Radhika Pandit. The film was a success and earned him the Filmfare Award for Best Supporting Actor. He went on to star in many commercially successful films including Modalasala (2010), Kirataka (2011), Drama (2012), Googly (2013), Raja Huli (2013), Gajakesari (2014), Mr. and Mrs. Ramachari (2014) Masterpiece (2015) and K.G.F: Chapter 1 (2018). His rise to success has been well documented by the media, and has been often rated one of the popular actors in Karnataka. Naveen Kumar Gowda was born in Bhuvanahalli, a town in Hassan district of Karnataka to Vokkaliga family. His father, Arun Kumar J., working in the KSRTC transport service, and later in the BMTC transport service, and his mother, Pushpa, is a homemaker. He has a younger sister, Nandini. His childhood days were spent in Mysore where he did his schooling in Mahajana High School. Soon after his studies, he joined the Benaka drama troupe which was formed by noted dramatist B. V. Karanth. Yash started his acting career with the teleserial Nanda Gokula directed by Ashok Kashyap, which aired on ETV Kannada. He went on to appear in several other teleserials such as Malebillu and Preeti Illada Mele. He had a small role in a 2007 film directed by Priya Hassan, Jambhada Hudugi. He then acted in Moggina Manasu directed by Shashank in 2008, where he appeared in a supporting role alongside his Nanda Gokula co-star Radhika Pandit. He won the Filmfare Award for Best Supporting Actor for his performance in the film. Yash then starred in lead roles in the films Rocky (2008), Kallara Santhe (2009), Gokula (2009). In 2010, Yash starred in Modalasala which became his first commercial solo hit. His next film was Rajadhani in 2011, which got good reviews and his performance was critically acclaimed although the film's return was below average at the box office. The same year, his next film Kirataka was a commercial success. Yash received positive reviews for his performance in the village comedy film. In 2012 Yash had two major releases, Lucky (opposite Ramya) and Jaanu, both of which met with mixed response upon release and became average grossers at the box office. His next film of the same year, the romantic comedy Drama directed by Yograj Bhat was a commercial success. The film was one of the major grossers of 2012. In his first release of 2013, Googly, a romance-drama, apart from a special appearance in a song sequence in Chandra who falls for Swati (played by Kriti Kharbanda). Directed by Pavan Wadeeyar, the film performed well, and was one among the highest-grossing Kannada films of the year. In 2014, he starred in Gajakesari, which was directed by Krisha, and became commercially successful at the box office. 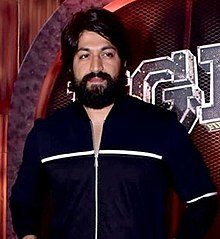 Yash's next film Mr. and Mrs. Ramachari opposite Radhika Pandit had its theatrical release on 25 December 2014, and opened to positive reviews and collected an estimated ₹50 crore and went on to become one of the highest grossing Kannada cinema, and which made him one of the highest-paid actors in Sandalwood. In 2015, he acted in Masterpiece, which opened to mixed reviews by the critics. In 2016, he starred in Santhu Straight Forward which performed well at the box-office by collecting ₹30 crore. His latest film is KGF, which is made with a budget of 80 crores, and released in Kannada along with its dubbed versions in Hindi, Telugu, Tamil, and Malayalam and has the highest production budget in Kannada cinema industry. It was speculated in the media that Yash had been in a relationship with actress Radhika Pandit for long, and especially after their film, Mr. and Mrs. Ramachari, that saw them portray the lead pair, and their third time together in films. Before the two disclosed it in public, their engagement took place in Goa in August 2016. They married on 9 December 2016 in a private ceremony in Bangalore, while Yash had openly invited everyone from Karnataka for their reception at Bangalore Palace. Their first child, a daughter, was born on 2 December 2018. In 2017 Yash along with his actress wife Radhika Pandit founded an organization and named it as Yasho Marga Foundation which marks their contribution towards the betterment of the society. As a first step, the foundation took up the water crisis issue in Koppal district of Karnataka by reportedly investing ₹4 crores towards the desiltation of the lakes and providing pure drinking water to the drought affected areas. • All the films are in Kannada language, unless otherwise noted. 2011 Raja Sowmya Sathyan N. R.
Cameo appearance in song "Tasse Otthu"
2014 Ramachari Santhosh Ananddram Also playback singer for song "Annthamma"
2015 Yuva Manju Mandavya Also playback singer for song "Annange Love Aagide"
↑ Refers to the year in which the award ceremony was held. ↑ "Who is Naveen Kumar Gowda in Sandalwood?". The Times of India. Retrieved 26 January 2017. ↑ "Yash looking for success". Indiaglitz. 6 October 2006. ↑ "Yash honed his acting skills in theatre". The Times of India. 21 August 2014. ↑ "SUDEEP, RADHIKA EMERGE AS TOP SANDALWOOD ACTORS". Bangalore Mirror. Retrieved 26 January 2017. ↑ "These hunks are the most desired men". The Times of India. Retrieved 26 January 2017. ↑ "Actor Yash family, childhood photos". Celebritykick. Retrieved 16 November 2015. ↑ "Yash honed his acting skills in theatre". The Times of India. 21 August 2014. Retrieved 26 January 2017. ↑ "Kannada Television Artistes Who Made It Big In Films". filmibeat. 7 August 2013. Retrieved 23 August 2014. ↑ Moggina Manasu bags five Filmfare awards. Filmibeat (3 August 2009). Retrieved on 11 November 2016. ↑ Rajadhani review. Rajadhani Kannada movie review, story, rating. IndiaGlitz.com (3 June 2011). Retrieved on 11 November 2016. ↑ Rajadhani Movie Review, Trailer, & Show timings at Times of India. Timesofindia.indiatimes.com. Retrieved on 11 November 2016. ↑ Review: Kirataka is a breezy entertainer – Rediff.com Movies. Rediff.com (27 June 2011). Retrieved on 11 November 2016. ↑ Kirathaka Movie Review, Trailer, & Show timings at Times of India. Timesofindia.indiatimes.com. Retrieved on 11 November 2016. ↑ Kirathaka review. Kirathaka Kannada movie review, story, rating. IndiaGlitz.com (25 June 2011). Retrieved on 11 November 2016. ↑ Review: Lucky is a treat to watch – Rediff.com Movies. Rediff.com (24 February 2012). Retrieved on 11 November 2016. ↑ Lucky Movie Review, Trailer, & Show timings at Times of India. Timesofindia.indiatimes.com (24 February 2012). Retrieved on 11 November 2016. ↑ Jaanu Movie Review, Trailer, & Show timings at Times of India. Timesofindia.indiatimes.com (1 June 2012). Retrieved on 11 November 2016. ↑ Kannada Review: 'Jaanu' is worth a watch – News18. Ibnlive.com (3 June 2012). Retrieved on 11 November 2016. ↑ It is over flow for DRAMA – Kannada Movie News. Indiaglitz.com (30 November 2012). Retrieved on 11 November 2016. ↑ Talukdar, Taniya (21 July 2013). "Googly is unpredictable: Yash". The Times of India. Retrieved 4 July 2017. ↑ S. Shiva Kumar (29 August 2013). "How different are they?". The Hindu. Retrieved 4 July 2017. ↑ "Gajakesari, Manam Affect Kochadaiyaan's Box Office Collection At Bangalore". filmibeat. 1 June 2014. Retrieved 23 August 2014. ↑ "Mr. and Mrs. Ramachari enters 50 crore club". ↑ Box Office Collection: 'PK', 'Mr & Mrs Ramachari' Dominate Bengaluru Collection Centres. Ibtimes.co.in (9 January 2015). Retrieved on 11 November 2016. ↑ "Birthday gift to Yash: Ramachari to enter cr club soon!". www.sify.com. ↑ "'Mr and Mrs Ramachari' Review: Audience Live Response". ibtimes.co.in. 25 December 2014. Retrieved 2 January 2015. ↑ Masterpiece movie review: Live audience response – IBTimes India. Ibtimes.co.in (24 December 2015). Retrieved on 30 September 2018. ↑ Santhu Straight Forward box office collection: Yash-Radhika-starrer hit by demonetisation – IBTimes India. Ibtimes.co.in (1 December 2016). Retrieved on 30 September 2018. ↑ KGF rockets through every budget barrier. The New Indian Express. Retrieved on 30 September 2018. ↑ "Yash's mom ready to take care of his wife!". The Times of India. 2 March 2015. Retrieved 30 October 2016. ↑ "Actors Yash and Radhika get engaged in Goa". India Today. 12 August 2016. Retrieved 30 October 2016. ↑ "Kannada actors Yash and Radhika Pandit tie the knot in a dream wedding, see pics". The Indian Express. 9 December 2016. Retrieved 26 January 2017. ↑ "There's something new in Yash and Radhika Pandit's life". The Times of India. 26 February 2017. ↑ "Yasho Marga Yashassu, Yash dilkush". Indiaglitz. 29 March 2017. ↑ Vijayasarathy, R. G. (21 July 2008). "Moggina Manasu works". Rediff.com. Retrieved 28 December 2018. ↑ Nathan, Archana (29 October 2016). "Far from straightforward". The Hindu. Retrieved 31 December 2018. ↑ R., Shilpa Sebastian (20 December 2018). "Kannada got funk". The Hindu. Retrieved 28 December 2018. ↑ Chaitra Krishnamurthy (3 January 2019). "KGF Chapter 2 : Vijay Kirangdur Announces The Release Date! Here's When The Shoot Begins". ↑ Xappie Desk (2 January 2019). "KGF Chapter 2 release date!". ↑ Kumar S., Nanda (16 February 2013). "He spells success". Deccan Herald. Retrieved 28 December 2018. ↑ S. M., Shashiprasad (1 August 2018). "Rad takes stork joyfully". Deccan Chronicle. Retrieved 28 December 2018. ↑ Kudige V., Samatha (28 April 2010). "A dream come true". Deccan Herald. Retrieved 3 January 2019. ↑ "56th Idea Filmfare Awards 2008 South: The winners". Retrieved 5 April 2015. ↑ "60th Idea Filmfare Awards 2013 (South) Nominations". Filmfare. Archived from the original on 7 July 2013. Retrieved 5 April 2015. ↑ "61st Idea Filmfare Awards (South) Nomination list". Filmfare. Archived from the original on 8 July 2014. Retrieved 5 April 2015. ↑ "SIIMA Awards 2014: Nominees and winners List for Kannada Movies". The Indian Express. 5 April 2015. Retrieved 5 January 2015. ↑ "Yash, Shwetha Srivatsav are Filmfare best actors". Retrieved 27 June 2015. ↑ "Kannada award winners at SIIMA". The Times of India. 11 August 2015. Retrieved 1 April 2018. ↑ "IIFA Utsavam: Here's a complete list of winners on day 2". Daily News and Analysis. 26 January 2016. Retrieved 1 April 2018. ↑ "Nominations for the 63rd Britannia Filmfare Awards (South)". filmfare.com. 7 June 2016. Archived from the original on 11 June 2016. Retrieved 1 April 2018. ↑ "SIIMA Awards 2016 Kannada Nominees, Winners List & Show Details". worldhab.com. 28 June 2016. Archived from the original on 1 April 2018. ↑ "SIIMA Nominations: Theri, Janatha Garage, Maheshinte Prathikaram and Kirik Party lead". The Indian Express. 31 May 2017. Retrieved 1 April 2018.